I had a couple of apples to use up and so this recipe came in handy to use them up. The muffins were tender and had just the right amount of sweetness and healthy breakfast muffin too.Apples in every bite! .The brown sugar topping is a must(actually i forgot sprinkle some brown sugar on top of it ). Sending this recipe to Paris "Only With Grains" Event happening @ cookingwithSJ. and to Vardhini "Dish it out - Fiber Rich Event" hosted by me. 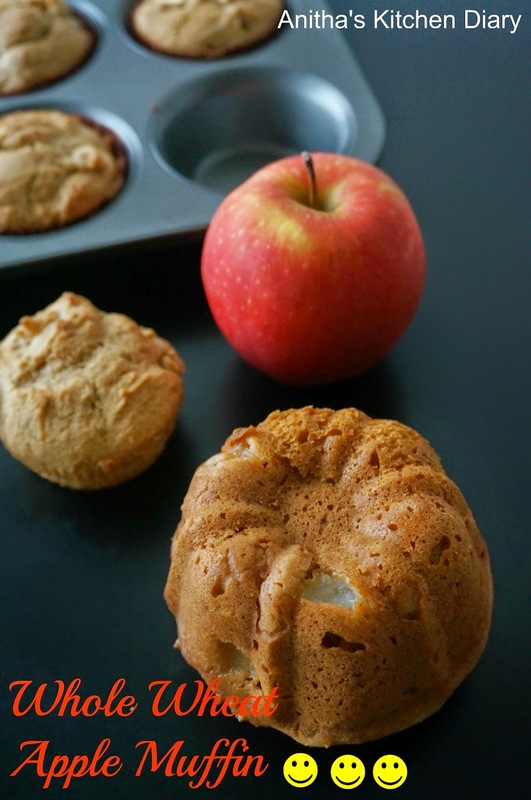 Wash ,peel and chop the apple.Preheat the oven to 400F.Grease or line the muffin tray. In mixing bowl , mix wheat flour,All Purpose Flour , cinnamon , baking soda,baking powder and salt. In a separate bowl cream the butter and then add granulated white sugar and brown sugar. Beat them until fluffy . Add egg and mix well. Add yogurt and mix well.Add the dry ingredients gradually and mix well.Fold in the chopped apple. Pour the batter equally into the prepared muffin tray.Sprinkle some brown sugar on top of it. Bake it for 10 - 15 minutes or until toot pick inserted comes out clean. Cool it for 5 minutes and then serve.